Discussion in 'UFOs, Aliens, Monsters, and the Paranormal' started by Mick West, Jul 6, 2015. The Mars Curiosity Rover has taken tens of thousands of photographs, and in those photographs are millions of rocks. It's inevitable that if you stare at millions of rocks for long enough, then you'll find a rock that resembles something. The image was taken by the Curiosity Rover’s Right Mastcam on Sol 978 (May 7). Despite the startling symmetry of the pyramid, none of the Curiosity Rover’s subsequent photos taken at 20 to 30 sec intervals in the following few minutes and the subsequent photos hours later, included the object. It appears that the NASA operators of Curiosity deliberately chose not to take another photo or zoom in on the pyramid. If they however did so, none of these subsequent photos were released to the general public. A Youtube video of the pyramid compares it to human-made pyramids that are similar in size to what was photographed by the Curiosity Rover. There is good reason to suspect, however, that the actual size of the Mars pyramid is much larger given the amount of debris and sand around it. It's quite clear why no more photos were taken of the rock, it's just a tiny rock, quite a bit in the distance, that just happened to show up in one photo. One rock out of literally thousands seen within a few minutes. If you look at the wider panorama it's clear it's on a near by hill, and is actually quite small. In fact NASA scientists analyzed the photo, and determined it was about four inches tall. And these "pyramids" are not that uncommon on Mars. Here's another one, or maybe two. Look how incredibly straight the edges are, can this possibly be natural? Actually yes, I joke a little to illustrate the point. Those are just two small rocks in my back yard. I went outside to see how how easy it was to duplicate the image with just natural rocks and my iPhone. The rocks round here (El Dorado County, California) naturally fracture along straight lines, and the two pieces I propped up were just laying on the ground by the rock formation. And they are about the same size as the Mars rock. Not quite as straight sided as the smaller examples, but remember this is just me wandering around outside for ten minutes. 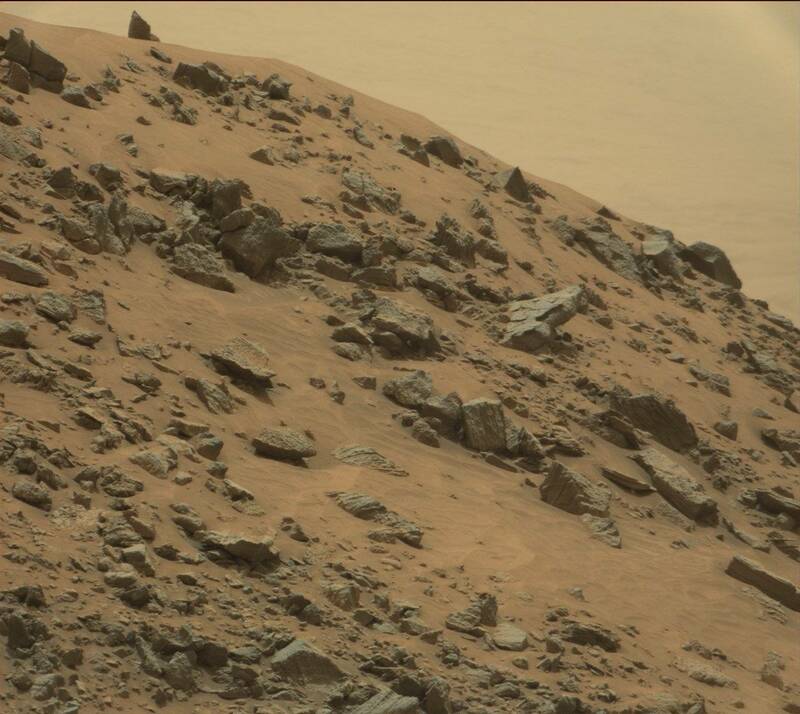 Curiosity has been taking photos for years, and there's a lot more rocks on Mars than there is in my back yard. A small pyramid shaped rock is simply an inevitability. I'm totally jealous. Did i mention i collect rocks and triangles are my favorites? have these two sitting on my desk right now. Youre gonna have to fed ex me a bunch, yours are much straighter than ours. My 5 year old granddaughter noticed this morning that the inside of one of her cheerios formed a triangle. Maybe she's on to something. maybe Martians are really small ? Sometimes these images are captured by Curiosity's Navcams which are mounted to give a stereoscopic view. The distance of an object from the cameras can easily be computed with a little trig. The cameras are separated by 42.4 cm and have an image resolution of 0.82 milliradians/pixel (0.047°/pixel). For a quick calculation accurate for most circumstances, measure the difference in horizontal pixel position between a common point in a pair of images and divide that difference into 517 to get the distance in meters. The "woman" is offset by 75 pixels between the two Navcam images. That means she is 6.9 meters from the cameras. She is 15 pixels tall. At the above distance from the camera she would be 8.5 centimeters (3.3 inches) tall. Martian Zulu woman? There are taller than average humans here on Earth too... Seems like anything under 10 cm would be reasonable height for the imaginary mini beings that are being suppressed by NASA? She look hot and well built BTW! She look hot and well built BTW! she looks like a young david bowie in drag. wowzers!!!! sounds hot to me!!! but then I lost my virginity aged 28, to a woman who looked like Ronnie Corbett. I wish my wife had glasses like that. I'd never be without a fire starter. Exactly, that is the law of large numbers. When you have enough random stuff there are always patterns to find that are less random. It's really cool how intricate the erosion patterns on that rock are. A formation like that on Earth wouldn't last long before weather or life broke it off.